We all have those moments of sheer panic when we have some place to be and not much time eat, let alone cook. More often than not I come home from work with barely an hour to get everything together before I parade off into the sunset for some kind of commitment I made. But if you’re not prepared and if you’re not confident in your awesome kitchen abilities, you can fall victim to the devil himself: aka. fast food. We’re guilty of it. But as we’ve moved forward with our baby steps to a happier, healthier life, we’ve moved away from the quick grabs that lead to the belly bloats and the grumpy grease-induced comas. And I’m not going to lie, I think I finally figured out how to have a quick and easy meal that doesn’t take much prep at all. Usually, I’d throw things in a crockpot that morning or cook something with enough leftovers the day before. But that doesn’t alway happen. And then I’m left in a panic. But not anymore. I recently discovered this with fish. I had stumbled upon a sale on individually wrapped 4 oz. tilapia filets at Food Lion so I grabbed a couple. The first night I was in a frenzy, this is what I did. That’s right…this whole meal came in under 15 minutes. Then the other night, I had a little more time but still not a lot of time to dawdle. This was more involved, but still pretty quick. 3. Season fish (I used olive oil, pepper, salt, Italian seasoning, and garlic powder) and set aside while I pop in sweet potato (under 8 minutes). 4. 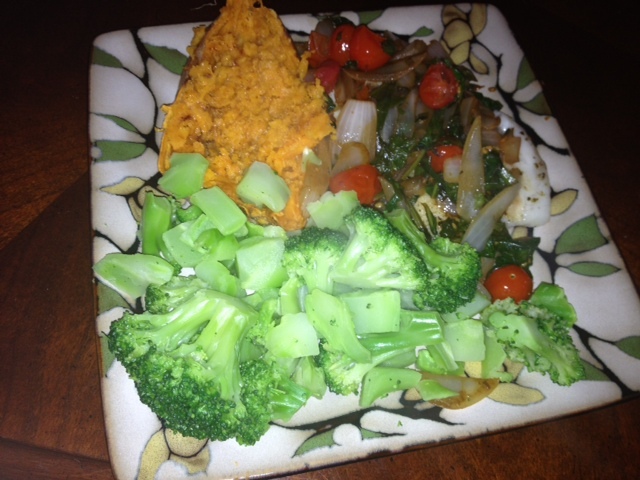 While sweet potato cooks, throw in onions into olive oil and garlic. Sautee. As they begin to soften, throw in balsamic vinegar. (While sweet potato was cooking). 5. Replace sweet potato with frozen broccoli steamer bag in the microwave (roughly 8 minutes). 6. 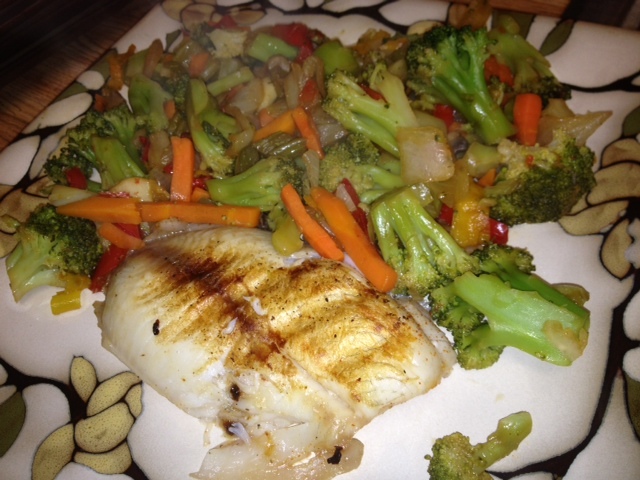 While broccoli is steaming, throw in rest of vegetables into sauté pan and in last 6-5 minutes of steaming, throw fish onto George Foreman grill. Yup…this meal too was just a little bit longer than 20 minutes. And really, it was easy. If it wasn’t for the chopping with a large knife for the veggies to top the fish, I’d say a 5 year old could do it. It really took no skill. The truth is, this was quicker than if I had run out, sat through a drive through, and ordered some fast food. Mind blowing, huh? And it doesn’t just have to be fish. When you buy in bulk chicken breasts to freeze, maybe package a few as individual breasts or just two (or whatever size your family is) instead of freezing a larger quantity for meals that would last for two days (like I usually do). Whether its a steamer bag or something you can sauté really quick– it’s worth it. It literally takes seconds to prepare. Maybe start off with something easy like a side salad. But trust me when I say keeping onions and sweet potatoes on hand really can be a game changer and up the “fanciness” of any meal. Plus, those sorts of vegetables stay fresher longer so they make a nice pantry staple (as long as you don’t forget about them. Totally works the same with chicken! Same seasoning and everythig!